The campaign for California gubernatorial candidate Meg Whitman wants an apology from her opponent, Jerry Brown, after his aide called the former eBay CEO a "whore"
(CNN) -- The California governor's race has devolved into a skirmish over the word "whore." An aide to the Democratic candidate called the Republican candidate that in an inadvertently recorded conversation, implying that she had sold out to special interests. 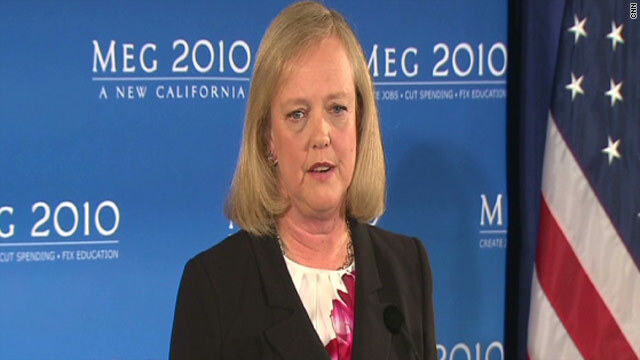 The Republican campaign of former eBay CEO Meg Whitman has demanded an apology. The Democratic campaign of California Attorney General Jerry Brown has responded. Brown's campaign manager Steven Glazer said: "This was a jumbled and often inaudible recording of a private conversation. At times, our language was salty. We apologize to Ms. Whitman and anyone who may have been offended." The conversation was recorded after Brown thought he'd disconnected a call to the Los Angeles police union. The union, the L.A. Police Protective League, turned over the recording to the Los Angeles Times. In it, the attorney general and his aides discussed resisting pressure to cut public-safety pensions or face losing police endorsements to Whitman. The race between Brown and Whitman is a high-stakes one, in the United States' most populated and economically powerful state. According to campaign-finance records filed Tuesday, Whitman has spent $140.1 million, eclipsing the amount spent on previous gubernatorial elections in California. By comparison, all the candidates in the 2006 gubernatorial election spent a combined $40.5 million, while 135 candidates spent a combined $49.9 million in the 2003 gubernatorial recall election. In 2002, gubernatorial candidates spent a combined $107.1 million. The former eBay CEO has donated a total of $119 million to her campaign, more than any candidate has spent in personal funds in a single campaign. The previous record was set by New York City Mayor Michael Bloomberg, who contributed $108.4 million to his 2009 re-election bid. "California is an expensive place to run a campaign, but this is still a staggering amount for one candidate to spend on one statewide election," CNN Political Research Director Robert Yoon said. "This is a level of spending you usually only see from major presidential candidates and national party committees." Brown has spent about $11 million on his campaign, but he didn't face any serious primary challenges and has enjoyed the support of spending by independent groups on his behalf. Groups partly funded by labor organizations have spent more than $10 million on television commercials attacking Whitman. Most recent polls of likely voters in California, including a CNN/Time/Opinion Research Corp. survey, indicate that Brown holds a single-digit advantage over Whitman. The winner of November's general election will succeed moderate Republican Gov. Arnold Schwarzenegger, who's prevented by term limits from running for re-election.